Helen leads the day-to-day activities of the Communications Team. 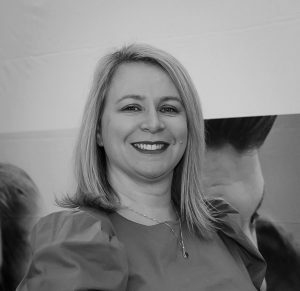 She has responsibility for providing strategic direction to a busy team which provides core marketing and communications support to all campaign areas, and incorporates activities such as PR, marketing, e-marketing, social media, website development, public affairs and events. She is integral to the planning and delivery of core events such as our annual Gala Awards and Responsible Business Conference. Outside of work, Helen is mum to Rafferty (14) and Farrah (11). She also loves creative projects and can often be found making table centres for wedding or events, or a piece of wall art. Helen spent six years as a school governor, just standing down this year. She has a keen interest in education and inspiring the future workforce. She is also relentless in finding development opportunities for members of her own, and the wider BITC, team members. Having lived in the US for three years, just south of Chicago, Helen has a passion for travel and new experiences – trying skiing for the first time in 2018.